I guess it’s almost 8 years old and unfortunately we haven’t taken the best care of the poor thing. It just sits outside unprotected from the elements while we use at our pleasure and in the summer we use it a lot! This is a little embarrassing to show you but here are some up close and personal pics of what it looked like before the makeover. Rust would be an understatement. Not only has it been sitting outside without a cover for years but also it’s not the most well built BBQ in history. We bought it when we were in college and had a very limited budget and went with the cheapest we could find. So the parts are not made of the best quality. I think that added to the quick decomposition of our grill. But all is not lost, yet! I think next year might be the year we get a new BBQ but it’s just not in our budget for this year so we need to make it work for just a bit longer! 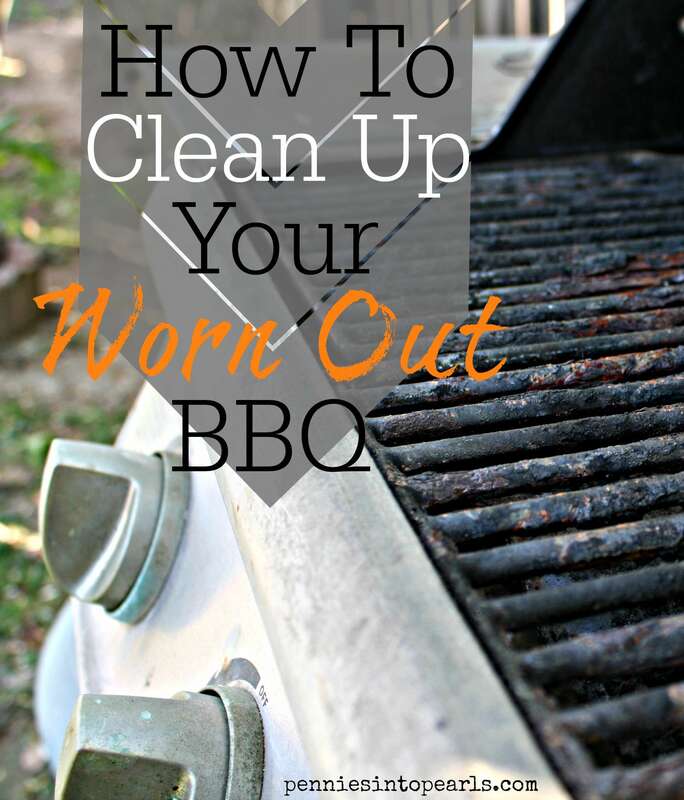 Hence, this article on how to clean your BBQ. First thing is to take off all removable parts and put them in a big tub for scrubbing. Warning: this is a dirty job! For us this included the grill grates and the things (technical term) that cover the gas burners. I had to be super careful because those covers have just about seen their last day. SO much rust with holes all over the place. One of them was so bad I thought it was going to snap in half! Now cover the parts in your tub with dish soap and water and let them soak for a few minutes. I decided to go a less abrasive rout since our pieces were so delicate due to all the rust but I have heard of people using oven cleaner or ammonia to get this part of the job cleaned. Too many chemicals for this pregnant mama! Also, you might want to hold off on using these chemicals on the actual grill grates since those pieces actually touch your food. Just sayin’, better safe than sorry. While the pieces are soaking I went back to work on the body of the grill. Take a look at what I found. Gross! Years and years of junk that had accumulated down there. Ugh! Super gross right? So all I did was take my hose on the “jet” setting and spray down the entire thing, outside and in. Then I took the wire side of a basic grill brush and lightly tried to scrub off as much grime as possible. You might be able to be a little more aggressive then I was but my grill was falling apart just as I was hosing it down. So I held back! 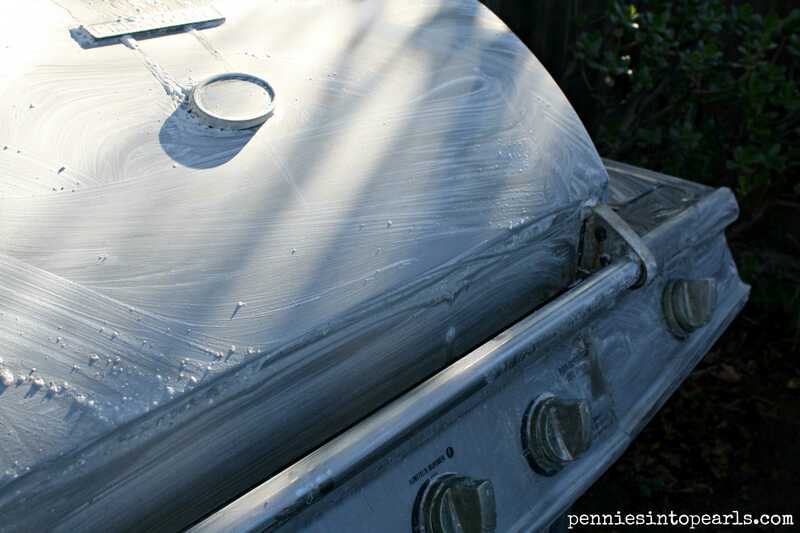 Next, I took some Comet Stainless Steal cleaner to the outside of the BBQ. I “bought” this stuff 2 years ago when it was on sale and I actually made $0.25 for buying it with coupons! (Yep, you can do that sometimes!) All you have to do is wet down the BBQ then sprinkle the Comet cleaner all over. Next, use a soft rag and rub it down to create a paste. Let that sit for 5 minutes then hose it off. It might leave a few little white specks of cleaner so just use your rinsed rag to buff it off as you are rinsing. 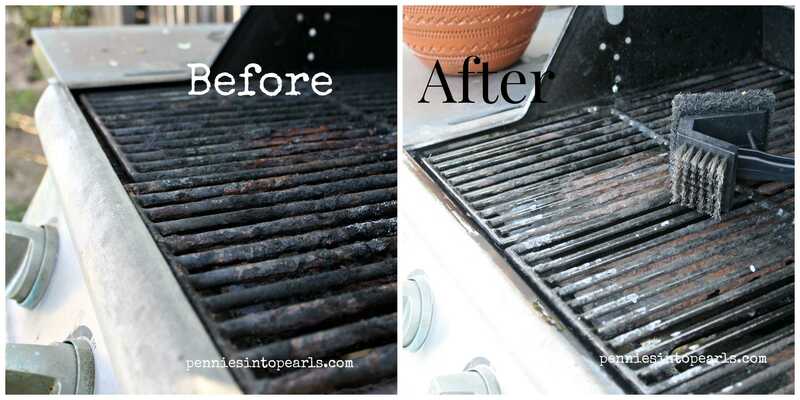 I used that same grill brush to scrub the parts that had been soaking in the soapy water. 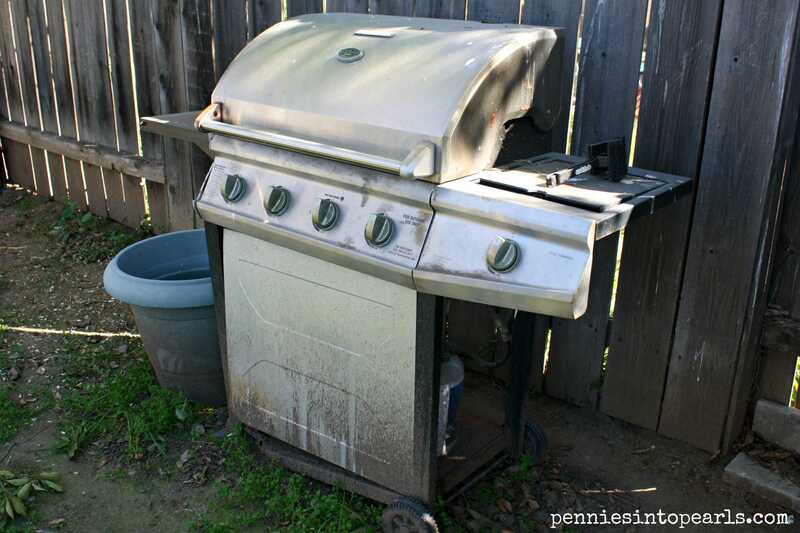 Again, our grill had so much wear on them that I had to be a little careful scrubbing away at it. 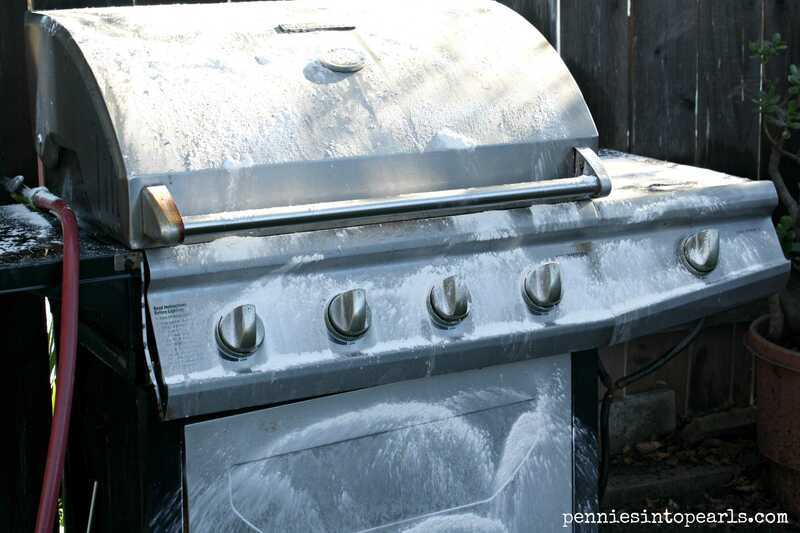 If your grill is a little more tough then ours, you might need to scrub and soak a few times. Once scrubbed to your content rinse them off and set them in the warm sunshine to dry off. Put it back together and enjoy! You did it! The dirty work is over! 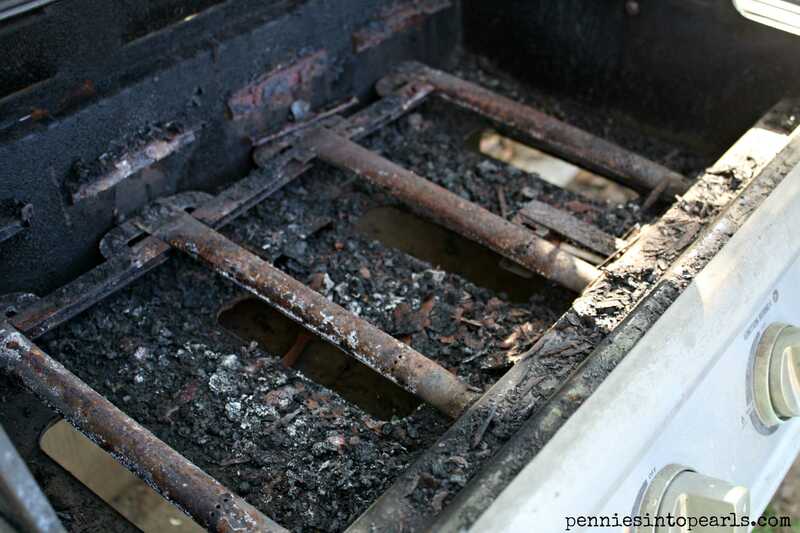 Once all the parts are dry put them back into the BBQ and you are ready for a summer full of delicious grilled meals! Now I just need to get a BBQ cover so I don’t have to do this all the time! Don’t forget to visit my Link Parties page to see all the great blogs were I share ideas at! Nice work! You’re making me feel guilty for the state that my BBQ is in. It’s been on the “we should really deep clean the BBQ” plan for an embarrassingly long time. Probably not longer than our embarrassingly almost 8 years of not doing a single thing to our BBQ. Its really nice to have a clean one now though! Good luck with your grill! Look at you go! The bbq looks fab, great work! I enjoy your website. Haha! Thanks Nancie! I think we will be needing a new one sooner than next summer. It keeps falling apart the more we use it. Started with 4 burners… down to 2! Nice job! We have an older grill that will have to be cleaned up in the spring. Unfortunately it’s 10 degrees here now, so grilling will have to wait a while. Burr! 10 degrees is cold! I would leave that grill to freeze and never go outside again! Just kidding. I bet it is beautiful there! Hope you get some warmer weather soon! Thanks for stopping by! Our grill is looking pretty sad too. I’m going to try your tips to see if I can clean it up a bit! Thanks for sharing! Good luck Candice on your grill! It’s a dirty job but totally worth it! Hahaha! It is definitely a messy job and I am glad it is over with! Thanks for stopping by Kyla! I added your link party to my “link party” page and can’t wait to party over at your place this Saturday! Thanks Jules! Yes it did work out pretty well! It was pretty easy also. Our poor BBQ has been outside unprotected for longer than I would like to admit. So if it works on ours I am sure it will work on yours! Thanks for stopping by! Great job 🙂 Feels good to get in there and make it “new” again 🙂 We are working on that ’round here, too. YAY! It sure does! I do think we might need a new BBQ sooner than later actually… Ours is nice and clean now but the pieces are all falling apart. But I think we will be buying a used one and replacing with new parts. 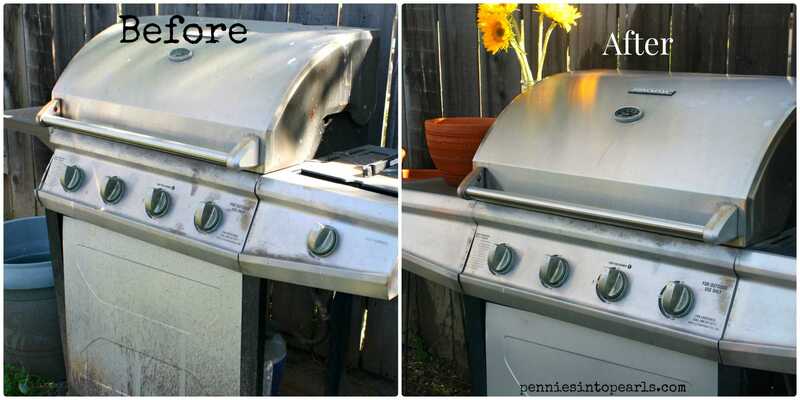 You have done an amazing job and the grill looks really well. 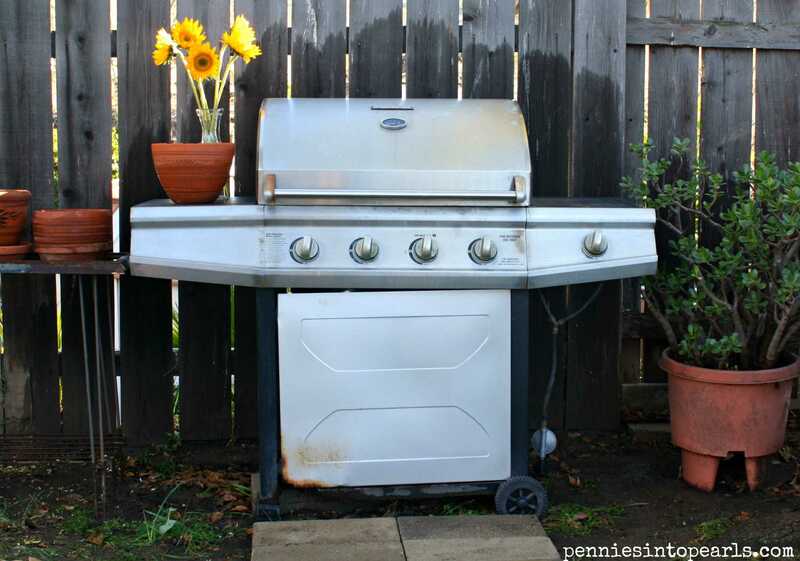 What are your thoughts on protecting the grill using a cover? Are covers worth the money in your opinion? A cover is totally worth the investment! 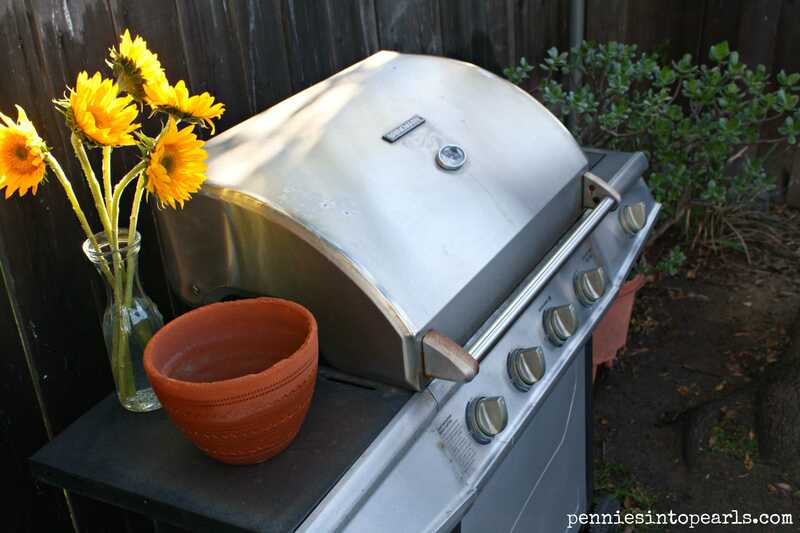 Especially if your grill is out in the open like ours!